So, Brighton and Buxton are out of the way, so here’s comes the big one. The Edinburgh fringe is not only the biggest open arts festival in the world, it is probably several times bigger than all the other open arts festivals put together. With hundreds of plays to choose from every day, it might seem impossible to know what’s the best thing to see. And I’m not going to pretend I know the answer. Most plays I see in Edinburgh are plays I’ve never heard of by groups I’ve never heard of, and I learn if they’re any good the hard way. (You can lessen this risk by reading reviews from ThreeWeeks, Broadway Baby or FringeReview, but I prefer to go with no preconceptions and make up my own mind.) However, I do recognise a handful of groups, and out of those I can make a few recommendations. In my last post on Fringe Festivals, I recommended Kemble’s Riot and Mess, and you can read why I recommend those shows in that article. I also recommended The Girl With No Heart, which I have since seen as a preview in Chatham and reviewed here. Since then, the full Fringe programme has come out and I can add a few more to the list. Absurd Person Singular is an Ayckbourn classic, but not the middle-class farce most people take it for. One of Alan Ayckbourn’s anecdotes is of a time he was sitting in a theatre watching someone else’s production of Absurd Person Singular. He found it so dreadful, he left halfway through. As he left, another man whispered “I don’t blame you mate, this is awful”. Ayckbourn decided this wasn’t the best time to say he was the writer. He didn’t say who the offending theatre company were, but I can guess what they were doing wrong. Alan Ayckbourn’s plays are often dismissed as light comedies with no depth. Previously, I’d suspected that the people whose expectations of Ayckbourn were set in stone by his comedies of the 1970s were people who haven’t bothered looking at his last three decades of work – but now I’m not even sure that explains it. Because he was already writing bleak plays back then including: Absent Friends (1974) centred on a man endlessly dwelling on his dead fiancée; Just Between Ourselves (1976) centred on a woman made permanently miserable by her domineering husband and family; and even as early as 1972, Absurd Person Singular is just as dark. And yet it still seems expected that you play it for laughs, laughs, belly-laughs, laughs and more laughs. 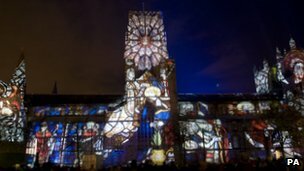 Lumiere is returning to Durham! Here’s a bit of non-theatre arts news for a change. Just heard the news that Durham County Council has decided to bring its light festival Lumière back to Durham in 2013. Well, I am back from the Buxton Fringe where I’ve seen a comparatively relaxing eight plays. Again, the eight have been of a good standard with few weak links, so once again the hurdles are a little higher than normal. But there were four plays in particular which stood out. Sparkle and Dark’s decision to take an untested play, The Girl With No Heart, to the Edinburgh Fringe instead of its safe bet is risky but admirably bold. The gamble deserves to pay off. You may recall that one of my Fringe recommendations from two months ago was a play by a little-known group called Sparkle and Dark’s Travelling players. Well, the Edinburgh Fringe isn’t for another month but I’ve seen it already, in Chatham, Kent. (In case you’re wondering what I was doing in Kent, I was already in London for a completely different reason and by sheer coincidence this was on nearby. I’m not rich enough to travel over half the country for one play.) I will come on to this play in a moment, but first a bit of background info.